“All manner of opportunities are presented to you at this time. 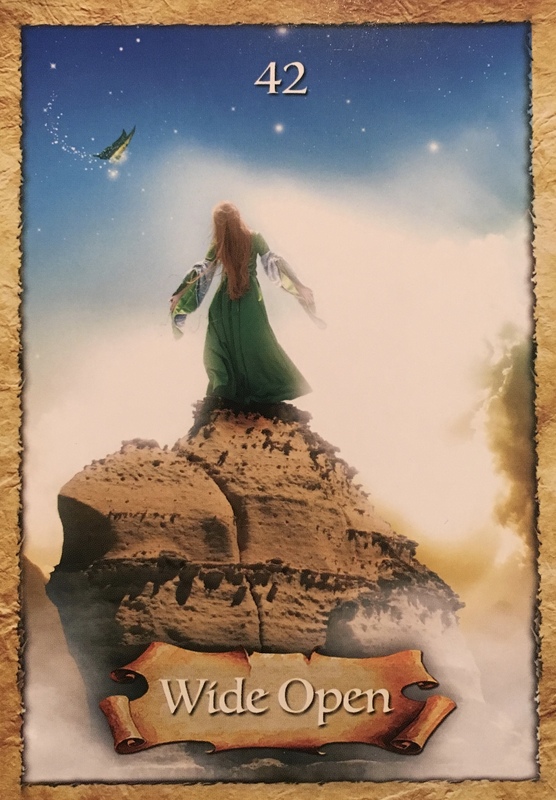 The Wide Open card is a signal that you are able to truly manifest your dreams and that your goals are in sight. Do not remain small and contracted. Instead, expand your horizons beyond what you believe to be your limitations. You have a unique voice that needs to be expressed in the world. The universe is supportive of new ideas and approaches at this time, so speak up and speak out. This card is the sign of the maverick who freely roams the wide open space of possibility. Allow for a greater vision to replace old ideas as you dream a grander dream. As we open up, we may wish to open those around us to what we are experiencing. Unfortunately, this cannot really be done. We cannot drag someone up to our vibrational frequency, no matter how good willed we are, or how we wish to work only for their highest good. People can only meet us where they are at at that particular moment in time. We may understand things faster, we may experience shifts in perception or perspective that they have not yet undergone. But we cannot experience these for anyone else, no matter how much it would benefit them. You can lead a horse to water, but you simply cannot and should not try to force them to drink. But you can inspire them. You can step into your own power, open your heart wide, and be everything you ever wanted them to be. If they are ready to meet you there, they will come. If you are meant to be together in this part of your journey, they will come. You being you; shining your light; sharing your gifts; finding your passion; joy and zest for life is the best tool of transformation on this planet. You being authentic. You being Love. You loving unconditionally. Yes, it might ruffle some feathers. Yes, someone might feel threatened at this new you at first and want to pull you back to who you were, rather than this shiny new version, the true version of you. But you will prevail. Nothing will hold you back from being you. Because that is why you are right here, right now. To be You. Healing the world through your love, your light. Being an anchor for the new frequencies, just as you agreed to be. This has come at the right time. I just got a new tattoo that says when she transformed into a butterfly,the caterpillars spoke of not her beauty but of her weirdness. They wanted her to change back into what she always had been. But she had wings. I have had people tell me that they want the old me back (one who use to do whatever work said and give in) but no more! Awesome Wendy! You go girl!!!!!!! YES!